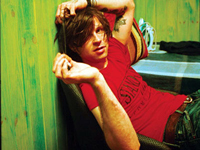 Mixing the heartfelt angst of a singer/songwriter with the cocky brashness of a garage rocker, Ryan Adams is at once one of the few artists to emerge from the alt-country scene to achieve mainstream commercial success and the one who most strongly refused to be defined by the genre, leaping from one spot to another stylistically as he follows his increasingly prolific muse. Adams was born in Jacksonville, NC, in 1974. While country music was a major part of his family’s musical diet when he was young (he’s cited Loretta Lynn, George Jones, Merle Haggard, and Johnny Cash as particular favorites), in his early teens Adams developed a taste for punk rock and he began playing electric guitar. At 15, Adams started writing songs, and a year later he formed a band called the Patty Duke Syndrome; Adams once described PDS as “an arty noise punk band,” with Hüsker Dü frequently cited as a key influence and reference point. The Patty Duke Syndrome developed a following in Jacksonville, and when Adams was 19 the band relocated to the larger town of Raleigh, NC, in hopes of expanding its following. However, Adams became eager to do something more melodic that would give him a platform for his country and pop influences. In 1994, Adams left the Patty Duke Syndrome and formed Whiskeytown with guitarist Phil Wandscher and violinist Caitlin Cary. With bassist Steve Grothman and drummer Eric “Skillet” Gilmore completing the lineup, Whiskeytown (the name came from regional slang for getting drunk) released their first album, Faithless Street, on the local Mood Food label. The album won reams of critical praise in the music press, and more than one writer suggested that Whiskeytown could do for the alt-country or No Depression scene what Nirvana had done for grunge. But by the time the band signed to a major label — the Geffen-distributed imprint Outpost Records — the band had undergone the first in a series of major personal shakeups; and in the summer of 1997, when Whiskeytown’s Outpost debut, Stranger’s Almanac, was ready for release, Adams and Wandscher were the only official members of the band left. Cary soon returned, but Wandscher left shortly afterward, and Whiskeytown had a revolving-door lineup for much of the next two years, with the band’s live shows become increasingly erratic, as solid performances were often followed by noisy, audience-baiting disasters. Consequently, as strong as Stranger’s Almanac was, Whiskeytown never fulfilled the commercial expectations created for them by others. In 1999, the band — which was down to Adams, Cary, and a handful of session musicians — recorded its third and final album, Pneumonia, but when Geffen was absorbed in a merger between PolyGram and Universal, Outpost was phased out, and the album was shelved; shortly afterward, Whiskeytown quietly called it quits.